From retro tiki bars that serve craft cocktails with kitch to sophisticated contemporary hotel lounges, there is something for everyone to get their drink on in the California Desert. In addition to Starbucks and other national coffee chains, the California desert also has some cool places to get your morning coffee buzz. The people at Bootlegger tiki bar can`t imagine anything better than quality time spent with friends over delicious tiki cocktails made with equal measure of rum + fruit + love. Located in the same space as the original Don the Beachcomber restaurant that opened in 1953, Bootlegger Tiki was fortunate to inherit an incredible piece of Palm Springs history and wanted to uphold the tiki traditions that were originally built there - craft cocktails, good friends and a couple of giant tiki torches thrown in for good measure. Ernest Coffee offers Stumptown coffee in an historic building in a prime Uptown Design District location. Fresh pastries and quiche, baked locally, are offered every day, and a selection of wine, beer & bubbly along with a carefully curated selection of cheese and charcuterie are also available. Koffi is arguably the California desert`s local coffee chain. Their coffee is not only served at their three coffee shops, it is also served at many local restaurants throughout the Palm Springs area. Koffi roasts their own beans at their Rancho mirage location. In fact, they are the only specialty coffee retailer with a roasting facility in the Coachella Valley. Scones, Muffins, Gourmet cinnamon rolls, Gourmet cookies and great breakfast sandwiches are all available to accompany your morning buzz. Listed below is their South Palm Springs location. Visit their website for others. Located at the front of the ultra cool Arrive Palm Springs Hotel is Customs Coffee. Customs Coffee serves locally roasted organic coffee from their friends at Joshua Tree Coffee Company. While built in 2015, Arrive Palm Springs buildings, including Customs Coffee, encompass a unified composition whose profile echoes the adjacent mountain ridges and alludes to the signature mid-century modern roofs of both �butterfly Alexanders� and �folded-plate Wexlers.� Specialty retail and restaurant spaces are also there for you to browse while sipping your favorite coffee drink. 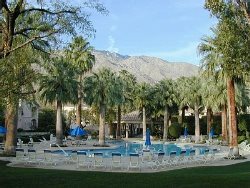 Located at the front of the ultra cool Arrive Palm Springs Hotel is Reservoir restaurant and bar. The bar is mostly outdoors and overlooks the pools and cabanas of the hotel. It also has great mountain views and people watching. It is a very comfortable and hip atmosphere that features wine, champagne, bucket o beer, specialty cocktails, mimosas and what they call a BYO Bloody Mary. BYO stands for Build Your Own. You pick the alcohol, either red or green as the color, and a topping. There is also a great food menu serving breakfast, lunch, dinner and late night snack. The kitchen is open from 8 - 11 while the bar is open until 2 am. This is a must visit while in Palm Springs. Located in the trendy Uptown Design District just North of downtown Palm Springs, Truss And Twine offers a mix of cocktail types from different eras. Golden Age Cocktails include drinks such as an Old Fashioned, Gimlet and a Brooklyn. Prohibition Era cocktails (1920 - 1933) include drinks like the Hanky Panky, Fallen Angel and Southside. Tiki Cocktails are the third cocktail category and include the classic Planter`s Punch drink along with lesser known cocktails like "Hotel Nacional Special", "3 Dots & a Dash" and "Queen`s Park Swizzle". The bar`s open kitchen features bar bites like Charcuterie and cheese plates, wagyu beef tartare, house made pretzel sticks wrapped in house made pastrami and whipped mustard butter, uni deviled eggs and marinated olives. If you have a sweet tooth, why not try the hazelnut-chocolate truffles or the Panna cotta.